My aunt gave us a waffle iron for Christmas years ago, and I hadn’t really used it much until the last year or so. It makes heart-shaped waffles, so I might’ve made them once or twice for Valentines’s day, but that’s about it. But now, it’s something I’ll make about once a week. One of my favorite things to do is make waffle sandwiches. I make a couple of waffles and fry some eggs. When the second waffle is cooked, I topped it with eggs and cheese, place the other waffle back on top and close the lid. I sometimes put a heavy pan on top to help press it down. Yum! On other days, I serve them topped with my Strawberry-Blueberry Compote, which is equally delicious. The waffles themselves aren’t really sweet, so the compote is a nice addition when you’re craving a sweeter breakfast dish. Here’s a tip I read on a couple of websites on how to keep your waffles from getting soggy as you make a batch. They recommended putting your cooked waffles into a pre-heated 150°-200°F oven directly on the oven rack as they come off the waffle iron. Haven’t tried this, but I probably will next time I make these. P.S. Waffle irons also make THE most delicious and crispy hash browns! Preheat waffle iron. 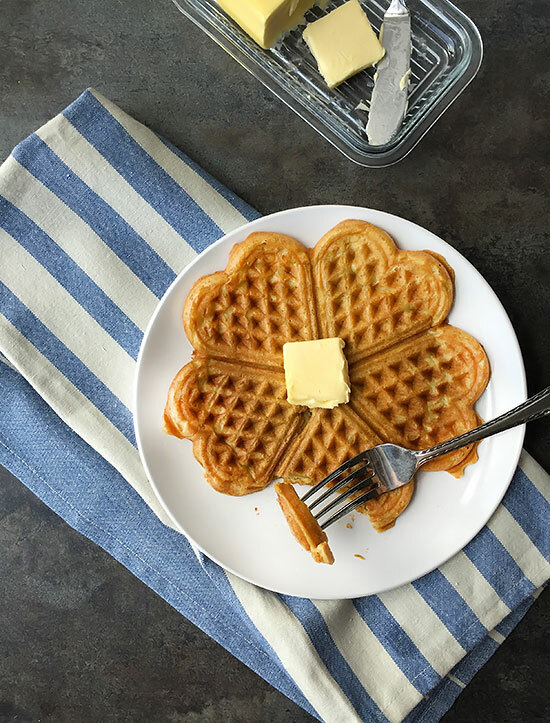 Grease the waffle iron with softened butter if not using non-stick. In a medium bowl, mix together the flour, salt, baking powder and baking soda. In another bowl, whisk together the egg, coconut milk and melted, cooled butter. Add the dry ingredients and stir to combine. 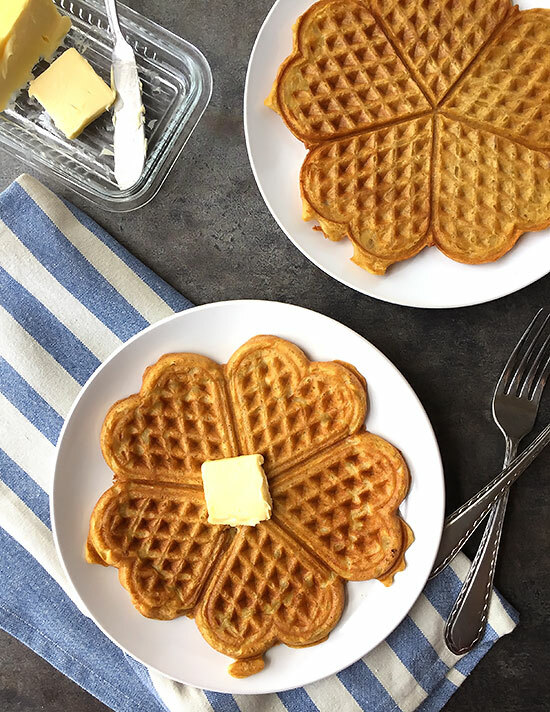 Spoon half a cup of batter into your waffle iron at a time and cook until golden brown. Serve immediately topped with butter, maple syrup or fresh fruit. 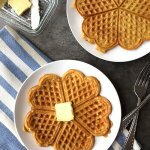 Here's a tip I've seen (but haven't tried yet) used to keep your waffles from getting soggy while cooking the rest. Prior to starting your waffles, pre-heat your oven to 150°-200° F, then place them directly on the oven rack as you finish them. I’m so sorry that your waffles stuck to the waffle iron. I’ve had that issue a couple of times when I’ve used reduced fat instead of whole cow’s milk, and it’s extremely frustrating. I know that the fat content can vary from brand to brand of canned coconut milk, so I’m wondering if it could possibly be due to that? The two brands that I buy are Native Forest and Natural Value, but I don’t recall which brand I tested this recipe with. Thanks, I used the organic Natural Value 17-19% milk fat, no guar gum, unsweetened.